For cakes, cupcakes, sandwich cookies, and more, buttercream is often the finishing—and perfecting—touch. This recipe is its most basic form, though it’s easily adaptable to a variety of flavors. It makes enough buttercream to frost a 25-cm/10-inch layer cake. Beat the sugar and butter on low speed until combined, then increase the speed to medium and beat until light and fluffy. Add the vanilla, salt, and milk and mix for another minute or two. 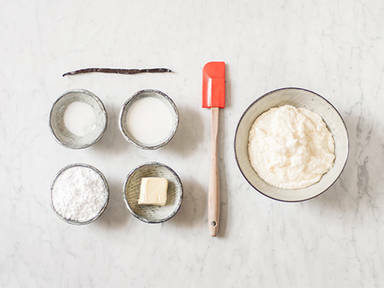 If the buttercream is too stiff, add a little milk; if it’s too loose, add a little more sugar.